Reasons you should have it removed. 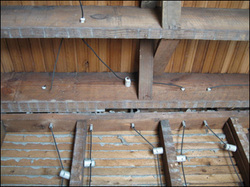 Knob and tube wiring was the very first type of household wiring that was installed. It utilizes only two wires per circuit, so that means that there is no grounding conductor, which in and of itself is a reason to tear it out. There are several reasons that you should have it replaced, so I will list them. 2. These wires get hotter than modern circuitry, so you can not put insulation in the wall with them. That means you can't insulate your attic floor, or your outside walls. If you do, it is a real and present fire hazard. 3. The wires are most assuredly overloaded. New houses have an average of 20 to 42 circuits. When the knob and tube was put in, nobody ever envisioned the amount of electrical load you would be putting on them. 4.The boxes that house receptacles and lights, are too small. The insulation on the wires will inevitably decay and cause a short circuit. 5. The slightest disturbance of the wiring, such as replacing a light or receptacle, could itself be fire hazard. 10. Some electronics rely on a ground wire to operate properly, so you may be putting undue stress on your PCs. The walls can be "fished", meaning strategically finding ways to get new wires in, with minimal wall damage. It is not cheap, but in the end it looks like it was always there. The other option it to use Wiremold surface conduit. Some people do not like it for aesthetic reasons, but it is probably less expensive. Once all of the knob and tube is permanently de-energized, you can insulate your house normally (and safely).